Unless you happen to live under a rock, you’ve heard about the MMD by Foose Mustang we’re giving away at the 2015 AmericanMuscle Car Show. 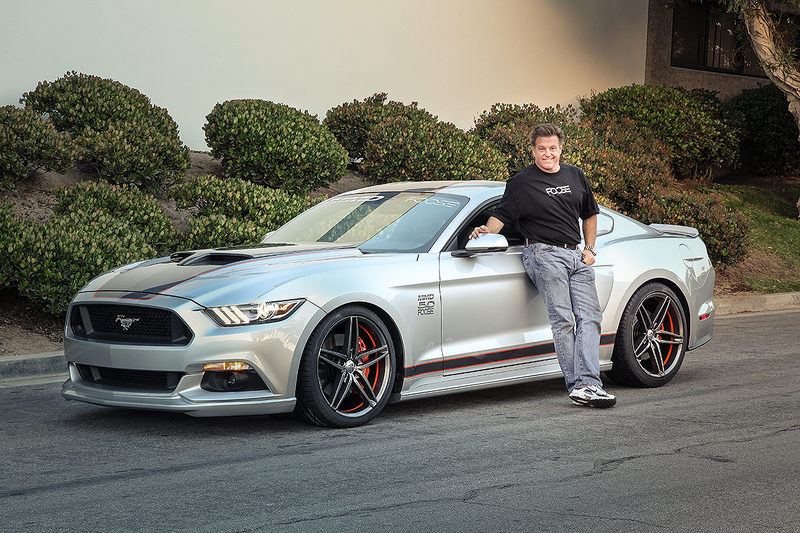 The MMD by Foose Mustang is the result of taking the vision and talent of Chip Foose and pairing it with the talent of the MMD team. Many months of careful planning and conceptualization went into building one of the most powerful and most stylish 2015 Mustangs ever to grace the pavement. Over a period of three build stages that used a mix of the hottest styling and performance parts, the MMD by Foose Mustang came to be. Watch the video below to see some behind the scenes action of the MMD by Foose Mustang being built and be sure to go here to see the rest of the build come together! The main highlight of MMD by Foose Mustang is the collaboration between Chip Foose and the MMD team that created all of the new MMD by Foose parts. All of the parts that were created for the build worked to completely alter the appearance of the MMD by Foose Mustang and bring out more of a muscle car feel. As you may remember, a lot of the early criticism around the S550 Mustang stemmed from the body work. Regardless of your stance on that criticism, Foose and MMD took traditional styling cues from the original Mustang and incorporated them into the new body style to deliver an incredibly fresh and innovative design. All through out the car you can find that retro/vintage inspiration which helped to fuel the creation of the new modern muscle look. The MMD by Foose Quarter Windows and Side Scoops are a great example of this inspiration as you can trace their creative inception all the way back to the ’67/’68 Mustang. 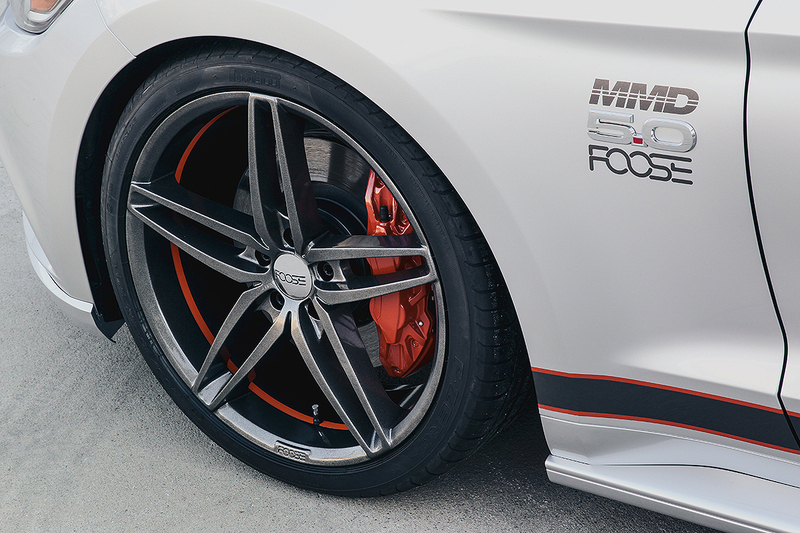 Even though the all of the attention has been on the body and styling of the MMD by Foose Mustang, the power and performance backing up those good looks is equally impressive. Taking the power to the next level is a Bama Performance Supercharger Kit which is powered by a 2.9L Whipple unit. The Bama Supercharger kit takes the power level of the otherwise stock ’15 up to a mind numbing 810 HP at the crank, which comes out to be a face melting 650 HP at the rear wheels. With the rest of the Mustang taking heavy inspiration from the classic Mustang’s of the 60’s, it was important to really get a good muscle car sound fitting of a traditional Mustang. A Mangaflow Competition Catback exhaust gave the MMD by Foose Mustang the ability to let it’s 5.0L engine howl with the sound of horsepower. 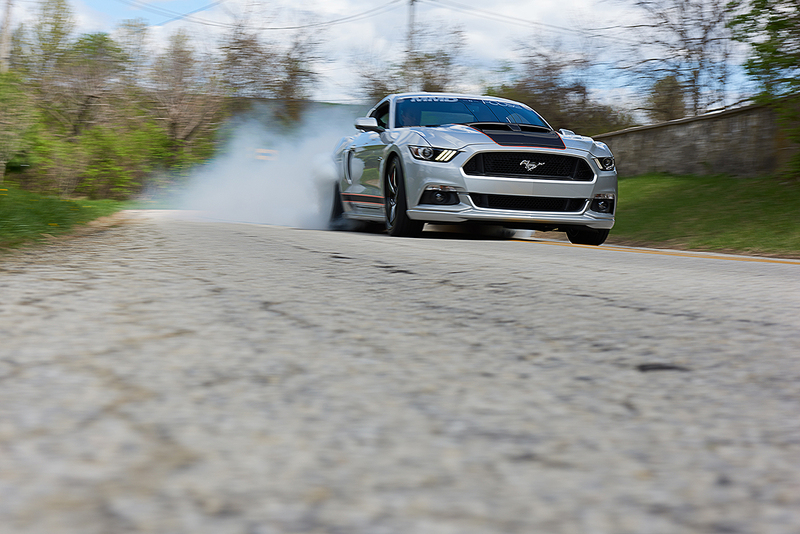 When muscling up with the kind of power the MMD by Foose Mustang is putting down, it is crucial to upgrade parts of the drivetrain to keep that power flowing to the pavement. Chip Foose and the MMD team turned to The Driveshaft Shop for a one-piece carbon fiber driveshaft and 1,400 HP halfshafts to ensure that each burnout is just as smokey as the last. A hallmark of any Foose vehicle is the wheels used on it and the MMD by Foose Mustang is no different. Chip went with a set of custom Foose Wheels that got accented with the same orange stripping found running down the body of the sleek ‘Stang. A set of Vogtland Sport Springs helped to make the wheels even more jaw-dropping (not that they needed any help to begin with) by eliminating the factory wheel gap for the perfect mix of show and go. With the MMD by Foose Mustang completely assembled, it was unveiled to universal praise from both the press and enthusiasts at Chip’s California based studio in Huntington Beach. The unveiling kicked off the giveaway for the MMD by Foose Mustang, which will be given away at the 2015 AmericanMuscle Car Show on August 15th. You could be the lucky winner who will recieve the keys from Foose himself at the show, by entering here!